Question 3: Why Don't My Guides Work For Me? 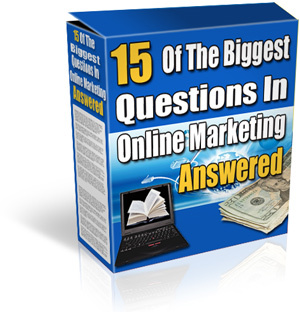 I'll show you the number one reason why most online business guides out there simply do not work for you saving you the hassles (not to mention the cash) wading through another document that's going to be a waste of your time. Question 4: Why Won't My Affiliates Sell? Affiliates are a powerful force and can make your business a lot of money if you can manage them correctly. Learn the methods straight from a marketer with almost 7 years of experience with this under his belt. Question 5: I Haven't Got A Product. What Can I Sell? I'll show you how to proceed if you don't have a product of your own for maximum positive progress in regard to the profit and growth of your online ventures. Question 8: Why Can't I Score Any JV's? When the difference between scoring a JV and not scoring a JV can mean a circulation of 0 for your product or a circulation of hundreds of thousands on launch day, it's important to get this right at all costs. I'll demonstrate how to do this, and at the same time show you how to avoid the pitfalls that destroy any chance for your future JV relationships with incorrect first contact methods.